Corinne Harmon, assistant professor, UCCS, College of Education gives a presentation on creating and sustaining change at the international level during Friday’s breakout session. Presenting alongside Harmon was Colleen Stiles, instructor, UCCS, College of Business. Personal journeys of success in both personal and professional settings and the techniques that help make them possible were among the issues addressed during this year’s University of Colorado Women Succeeding Symposium. The CU Faculty Council’s Committee on Women has sponsored the annual symposium for the past eight years as part of ongoing efforts to advance and support the success of women in academia. 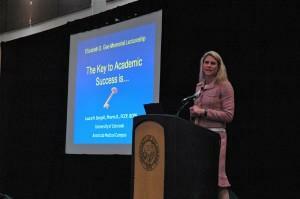 This year’s event was conducted at UCCS Feb. 24 and 25 and drew over 180 faculty and staff participants from all CU campuses. This year saw the expansion of the symposium to include a dinner event Thursday evening at The Lodge. Karen Jonscher, co-chair, Faculty Council Women’s Committee, said that 86 people attended the dinner, which focused on networking between the different campuses. Jonscher said the Faculty Council Women’s Committee received positive feedback after last year’s symposium. 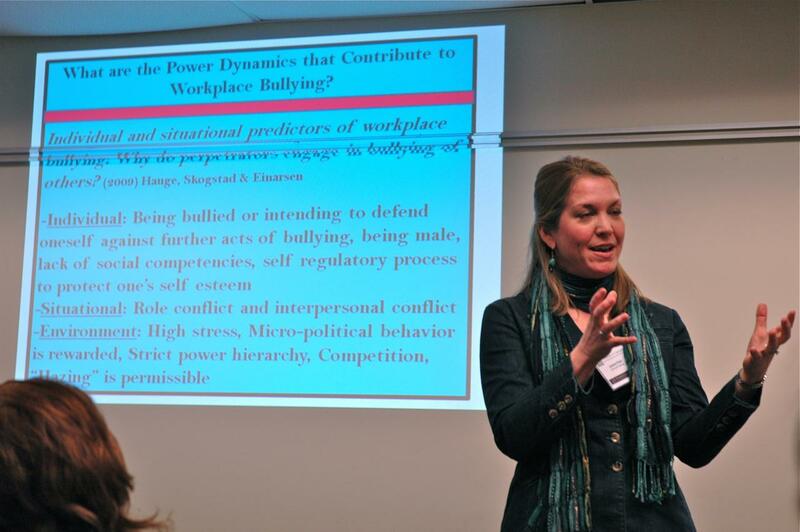 Julaine Field, associate professor, UCCS, College of Education addresses bulling in the workplace during Friday’s breakout session. Friday’s events began with an early breakfast and keynote address by Susan Avery, president and director, Woods Hole (Mass.) Oceanographic Institution. Avery previously served as a member of the CU Boulder faculty and was provost and executive vice chancellor for academic affairs. Avery spoke of the decisions and journey that took her from the University of Illinois, to CU Boulder, and finally to WHOI. According to Avery, every decision she made required the courage to change. Participants spent the rest of the morning attending breakout workshops which addressed topics ranging from creating sustainable change to the challenge of balancing a career and motherhood. Laura M. Borgelt, associate professor, CU-Denver, Clinical Pharmacy and Family Medicine presents her six “Pearls to Success” after being awarded the Elizabeth D. Gee Memorial Lectureship Award, which recognizes and honors an outstanding CU faculty member for efforts to advance women in academia, interdisciplinary scholarly contributions and distinguished teaching. 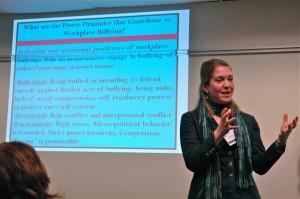 Field also led a workshop addressing workplace bullying. After the breakout sessions participants regrouped for lunch and to watch Laura M. Borgelt, associate professor, CU Denver, Clinical Pharmacy and Family Medicine receive the Elizabeth D. Gee Memorial Lectureship Award. The Gee Award recognizes and honors an outstanding CU faculty member for efforts to advance women in academia, interdisciplinary scholarly contributions and distinguished teaching. Established in 1992, the award honors the late Elizabeth Gee, a nursing faculty member, and spouse to former CU president Gordon Gee. Borgelt asked attendees to write down a personal passion that made them feel like their truest self. “Whatever you wrote down, that is your key to academic success,” she said. 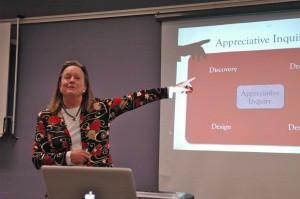 Borgelt’s keynote address outlined six pearls to success, using her passion of swimming to illustrate each element. Aspects of Borgelt’s pearls to success included being in the moment, exploring the unknown, asking others to engage, treating yourself and others with empathy, respect and integrity, and knowing you are beautiful.